Protecting your home is a top concern. Your home is your sanctity; it is where you raise your family and watch your children grow. It is also one of your largest assets and a major financial investment. For all of these reasons and more, you do what you can to secure and protect your home such as install home security systems with security signs. Even without an elaborate system in place, appropriate camera surveillance signs can deter would-be thieves or vandals by encouraging them to find an easier target. 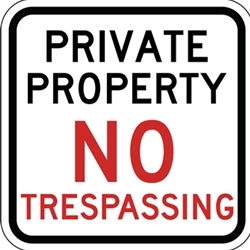 Though security and no trespassing signs can offer peace of mind and protection, they are worthless if they are hard to see, vandalized or torn down. Too many surveillance signs come with wimpy 6-inch or 8-inch posts and stands that can uprooted or knocked down with little effort. Depending on where you live, such thin or short sign stands may not hold up during the winter months or may get buried under snow. For all these reasons and more, a bold security sign with a flimsy stand makes a conflicting statement at best. Complete mounting sign hardware for one sign so there’s no need to order or go to your local hardware store to find the right sign mounts. Pre-drilled holes that are 3/8" in diameter and match the existing hole patterns in our stock of signs making for easy installation. Comprised of sturdy, but lightweight aluminum, one sign post is 48” tall X 1-1/4” X 1/8”. These posts support rectangular- and square-shaped signs with a vertical dimension of: 6", 12", and 18". They also support diamond shaped signs with dimensions of 12" and 18”. Large u-channel sign posts or other hardware are not needed for installation. A sledgehammer or standard hammer is recommended in order to put the stake in the ground at the proper level. 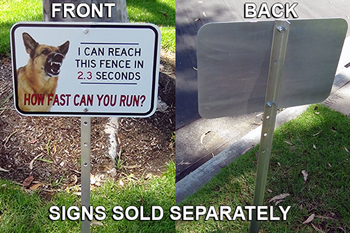 Buy our heavy duty aluminum signs posts here.